Jeev Milkha Singh starting from the tenth birdied three times on his first nine, the back stretch of the course before giving himself a scare with a double bogey on second. He birdied the third and closed with a birdie on ninth for his 69 and is now seven-under 137. The Indian trio of Jeev Milkha Singh, Shiv Kapur and SSP Chawrasia made the halfway cut Open D'Italia here. Kapur, lying second after the first round, struggled on the greens, as he missed a lot of makeable putts. He had three birdies and three bogeys in his round and slipped to tied 25th alongside fellow Indian, Jeev (69), while Chawrasia (69) was tied 41st. It was a minor celebration of sorts for the Indian trio, which has been missing a lot of cuts by narrow margins. Kapur, lying 119th on the Money List, needs a high finish to ensure his card for 2016, while Chawrasia, lying 95th on the Money List, badly needs a good finish this week to return to the Tour, where he lost his card last year. 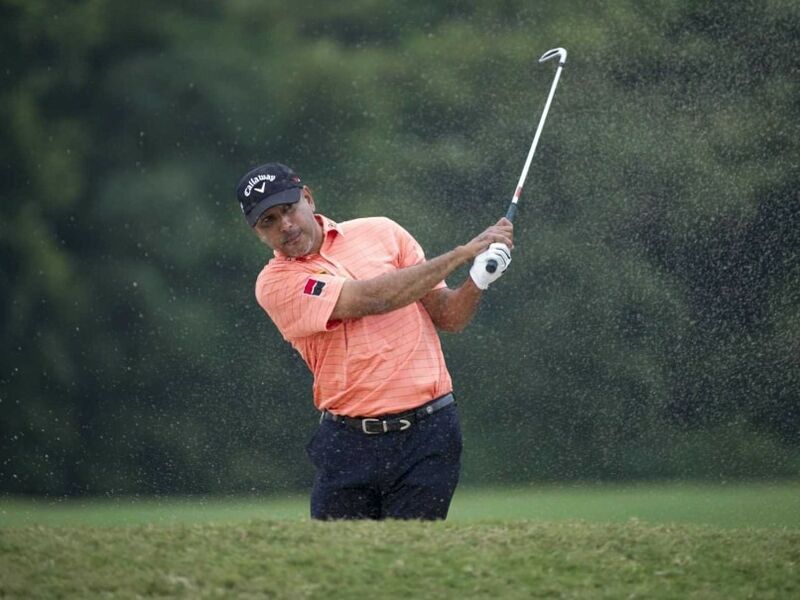 Jeev is 155th. Jeev starting from the tenth birdied three times on his first nine, the back stretch of the course before giving himself a scare with a double bogey on second. He birdied the third and closed with a birdie on ninth for his 69 and is now seven-under 137. Chawrasia, who has missed three cuts in a row, started on the tenth and bogeyed the 13th before getting back the shot on the next hole. He birdied three times on fourth, fifth and ninth to take the pressure off and keep the tempo going for a good week. Jens Fahrbring of Sweden and the Dane Lucas Bjerregaard share the halfway lead, but the Scandinavian duo will have to hold off a world-class chasing pack if they are to get their hands on the trophy on Sunday afternoon. Martin Kaymer, Nicolas Colsaerts, Danny Willett, Miguel Angel Jimenez and Bernd Wiesberger are among the big names taking aim at the leaders as the quality quintet moved within striking distance. Fahrbring and Bjerregaard set the pace of 13 under par after respective second round scores of 64 and 65, with last year's US Open Champion Kaymer carding a 66 to move to ten under, joining Weisberger, Rikard Karlberg, Craig Lee, David Lipsky and leading Italian Andrea Perrino in a tie for seventh place. Jimenez and Willett are one stroke behind Kaymer and company, while Colsaerts followed up his outstanding first round of 63 with a solid 70 to join Pedro Oriol, Romain Wattell and Fabrizio Zanotti in a tie for third place just two strokes off the lead. It was an emotional day at the Golf Club Milano as Italian golf legend Costantino Rocca waved farewell to an adoring home crowd as he made his last appearance on The European Tour.